What could be more convenient than dashing off a quick email using Outlook while sitting in the park or riding a taxi? It’s so much better than being stuck at the office. The scenery is a lot nicer, and the coffee even tastes better. Tap the new email icon at the top right side of the list of email messages. On an iPad, that icon looks like a square with a pencil in it. On the Android version, it’s a circle with a plus sign in it in the lower-right corner of the screen. That opens a new message form, along with the onscreen keyboard, and there’s a blinking cursor in the To box of the message form. Type the first few letters of an email address or the first letters of the name of the person you’re emailing. As soon as Outlook sees a name or address beginning with the letters you type, it shows a list of matching names and email addresses. In many cases, the person you want to email is listed there. If he or she is, just tap the name and then that person’s name and address are automatically put into the To box. If the name doesn’t appear, type in the entire email address. Tap the Subject line and enter a subject. A subject line isn’t absolutely mandatory, but it’s a good idea. Tap the main part of the message box and enter your message. Because you may be typing on a glass screen, you may want to be brief, but that’s up to you. You’ll find the Send icon appears in the upper-right corner of the message screen. It looks like an arrowhead pointing to the right. Tap it to send your message on its way. 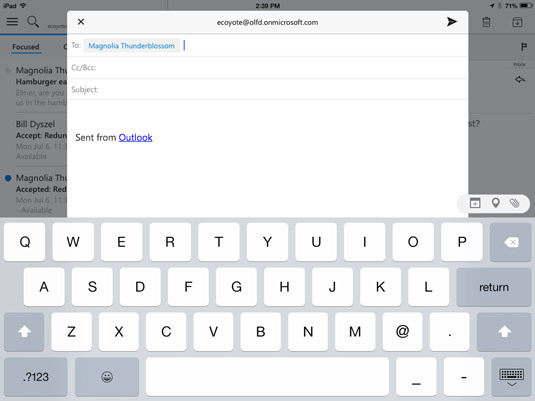 The new message form in Outlook on an iPad. Forwarding a message is very similar to composing a new message in that you have to enter an email address, but other than that, it requires the same steps as a reply.